Observed patterns of forms and events guide organization and classification, and they prompt questions about relationships and the factors that influence them. Patterns exist everywhere—in regularly occurring shapes or structures and in repeating events and relationships. For example, patterns are discernible in the symmetry of flowers and snowflakes, the cycling of the seasons, and the repeated base pairs of DNA. K-2 Children recognize that patterns in the natural and human designed world can be observed, used to describe phenomena, and used as evidence. 3-5 Students identify similarities and differences in order to sort and classify natural objects and designed products. They identify patterns related to time, including simple rates of change and cycles, and to use these patterns to make predictions. 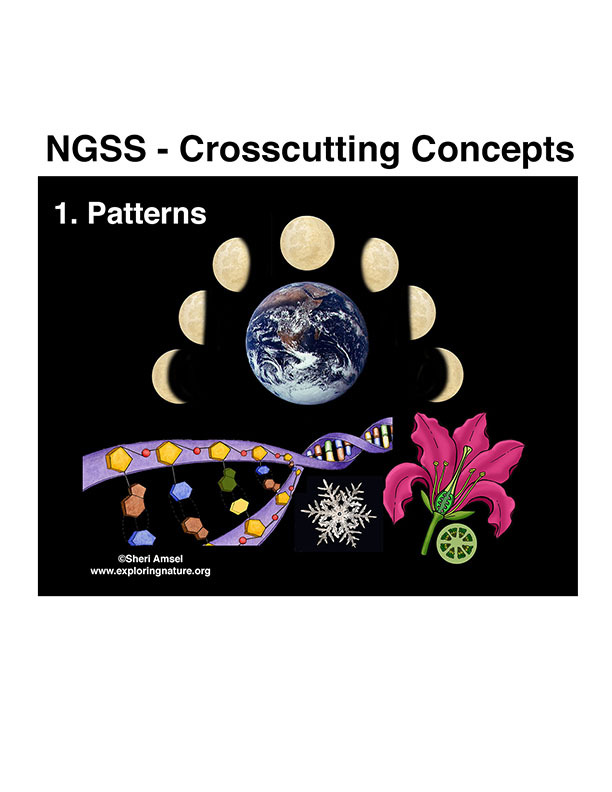 6-8 Students recognize that macroscopic patterns are related to the nature of microscopic and atomic-level structure. They identify patterns in rates of change and other numerical relationships that provide information about natural and human designed systems. They use patterns to identify cause and effect relationships, and use graphs and charts to identify patterns in data. 9-12 Students observe patterns in systems at different scales and cite patterns as empirical evidence for causality in supporting their explanations of phenomena. 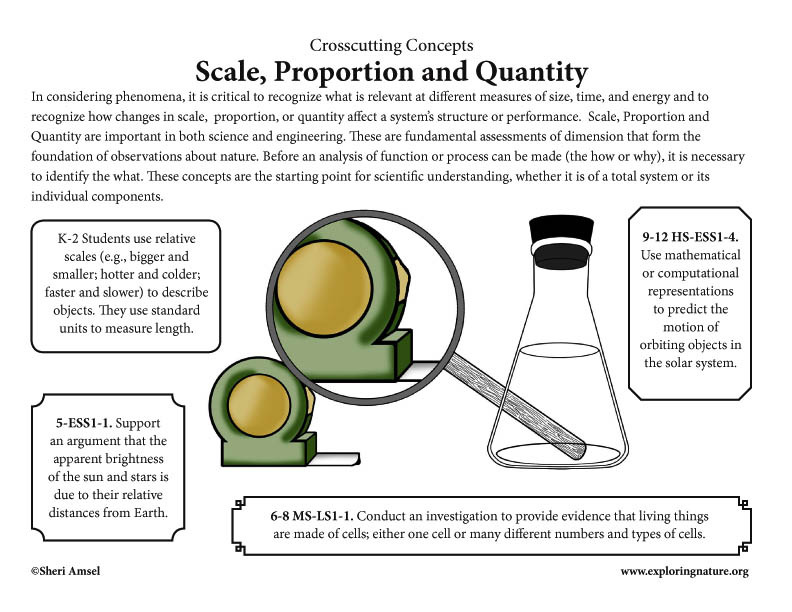 They recognize classifications or explanations used at one scale may not be useful or need revision using a different scale; thus requiring improved investigations and experiments. They use mathematical representations to identify certain patterns and analyze patterns of performance in order to reengineer and improve a designed system. Cause and effect is often the next step in science, after a discovery of patterns or events that occur together with regularity. A search for the underlying cause of a phenomenon has sparked someof the most compelling and productive scientific investigations. K-2 Students learn that events have causes that generate observable patterns. They design simple tests to gather evidence to support or refute their own ideas about causes. 3-5 Students routinely identify and test causal relationships and use these relationships to explain change. They understand events that occur together with regularity might or might not signify a cause and effect relationship. 6-8 Students classify relationships as causal or correlational, and recognize that correlation does not necessarily imply causation. 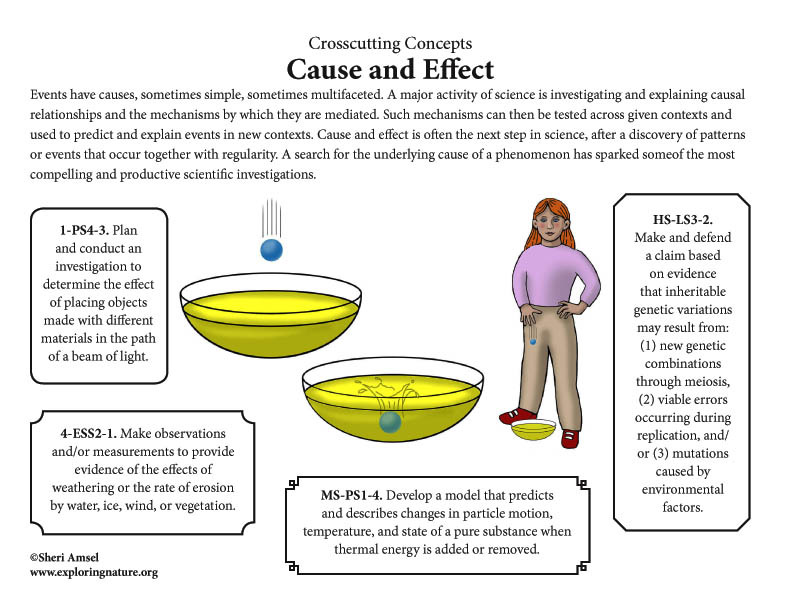 They use cause and effect relationships to predict phenomena in natural or designed systems. They also understand that phenomena may have more than one cause, and some cause and effect relationships in systems can only be described using probability. 9-12 Students understand that empirical evidence is required to differentiate between cause and correlation and to make claims about specific causes and effects. They suggest cause and effect relationships to explain and predict behaviors in complex natural and designed systems. They also propose causal relationships by examining what is known about smaller scale mechanisms within the system. They recognize changes in systems may have various causes that may not have equal effects. Scale, Proportion and Quantity are important in both science and engineering. These are fundamental assessments of dimension that form the foundation of observations about nature. Before an analysis of function or process can be made (the how or why), it is necessary to identify the what. These concepts are the starting point for scientific understanding, whether it is of a total system or its individual components. K-2 Students use relative scales (e.g., bigger and smaller; hotter and colder; faster and slower) to describe objects. They use standard units to measure length. 5-ESS1-1. Support an argument that the apparent brightness of the sun and stars is due to their relative distances from Earth. 3-5 students recognize natural objects and observable phenomena exist from the very small to the immensely large. They use standard units to measure and describe physical quantities such as weight, time, temperature, and volume. 6-8 MS-LS1-1. Conduct an investigation to provide evidence that living things are made of cells; either one cell or many different numbers and types of cells. 9-12 HS-ESS1-4. Use mathematical or computational representations to predict the motion of orbiting objects in the solar system. 9-12 Students understand the significance of a phenomenon is dependent on the scale, proportion, and quantity at which it occurs. They recognize patterns observable at one scale may not be observable or exist at other scales, and some systems can only be studied indirectly as they are too small, too large, too fast, or too slow to observe directly. Students use orders of magnitude to understand how a model at one scale relates to a model at another scale. They use algebraic thinking to examine scientific data and predict the effect of a change in one variable on another (e.g., linear growth vs. exponential growth). Systems and System Models are useful in science and engineering because the world is complex, so it is helpful to isolate a single system and construct a simplified model of it. K-2 Students understand objects and organisms can be described in terms of their parts; and systems in the natural and designed world have parts that work together. 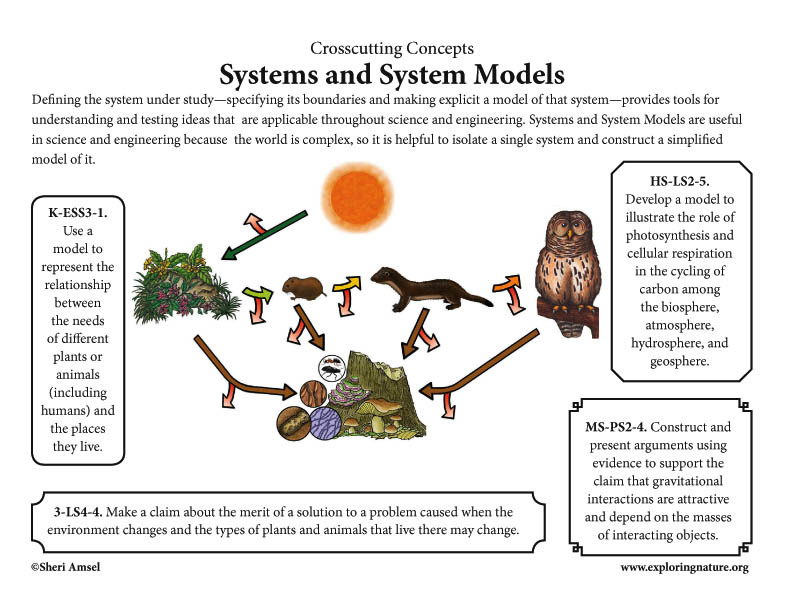 3-5 Students understand that a system is a group of related parts that make up a whole and can carry out functions its individual parts cannot. They can also describe a system in terms of its components and their interactions. 6-8 Students can understand that systems may interact with other systems; they may have sub-systems and be a part of larger complex systems. They can use models to represent systems and their interactions—such as inputs, processes and outputs—and energy, matter, and information flows within systems. They can also learn that models are limited in that they only represent certain HS-LS2-5. Develop a model to illustrate the role of photosynthesis and cellular respiration in the cycling of carbon among the biosphere, atmosphere, hydrosphere, and geosphere. aspects of the system under study. 9-12 Students can investigate or analyze a system by defining its boundaries and initial conditions, as well as its inputs and outputs. They can use models (e.g., physical, mathematical, computer models) to simulate the flow of energy, matter, and interactions within and between systems at different scales. They can also use models and simulations to predict the behavior of a system, and recognize that these predictions have limited precision and reliability due to the assumptions and approximations inherent in the models. They can also design systems to do specific tasks. 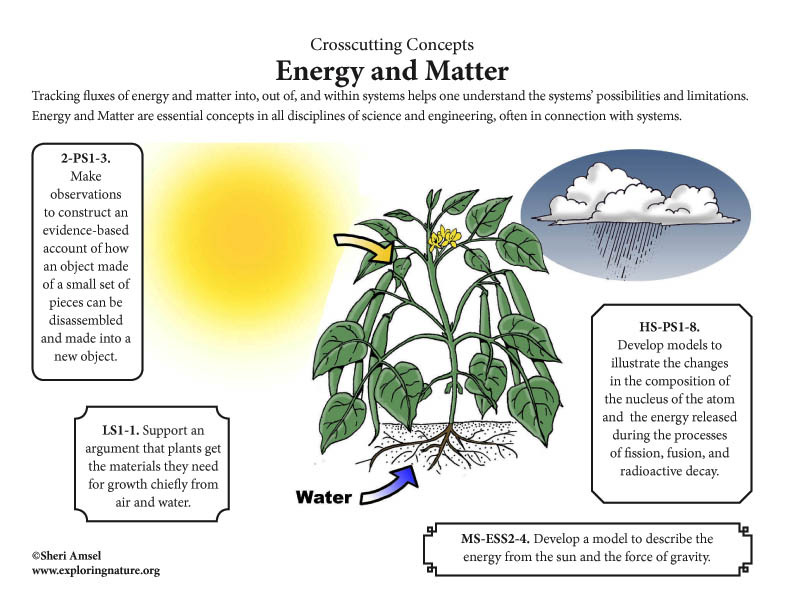 Energy and Matter are essential concepts in all disciplines of science and engineering, often in connection with systems. K-2 Students observe objects may break into smaller pieces, be put together into larger pieces, or change shape. LS1-1. Support an argument that plants get the materials they need for growth chiefly from air and water. 3-5 Students learn matter is made of particles and energy can be transferred in various ways and between objects. Students observe the conservation of matter by tracking matter flows and cycles before and after processes and recognizing the total weight of substances does not change. MS-ESS2-4. Develop a model to describe the energy from the sun and the force of gravity. 6-8 Students learn matter is conserved because atoms are conserved in physical and chemical processes. They also learn within a natural or designed system, the transfer of energy drives the motion and/or cycling of matter. Energy may take different forms (e.g. energy in fields, thermal energy, energy of motion). The transfer of energy can be tracked as energy flows through a designed or natural system. 9-12 Students learn that the total amount of energy and matter in closed systems is conserved. They can describe changes of energy and matter in a system in terms of energy and matter flows into, out of, and within that system. They also learn that energy cannot be created or destroyed. It only moves between one place and another place, between objects and/or fields, or between systems. Energy drives the cycling of matter within and between systems. In nuclear processes, atoms are not conserved, but the total number of protons plus neutrons is conserved. Structure and Function are complementary properties. “The shape and stability of structures of natural and designed objects are related to their function(s). The functioning of natural and built systems alike depends on the shapes and relationships of certain key parts as well as on the properties of the materials from which they are made. K-2 Students observe the shape and stability of structures of natural and designed objects are related to their function(s). 3-5 Students learn different materials have different substructures, which can sometimes be observed; and substructures have shapes and parts that serve functions. 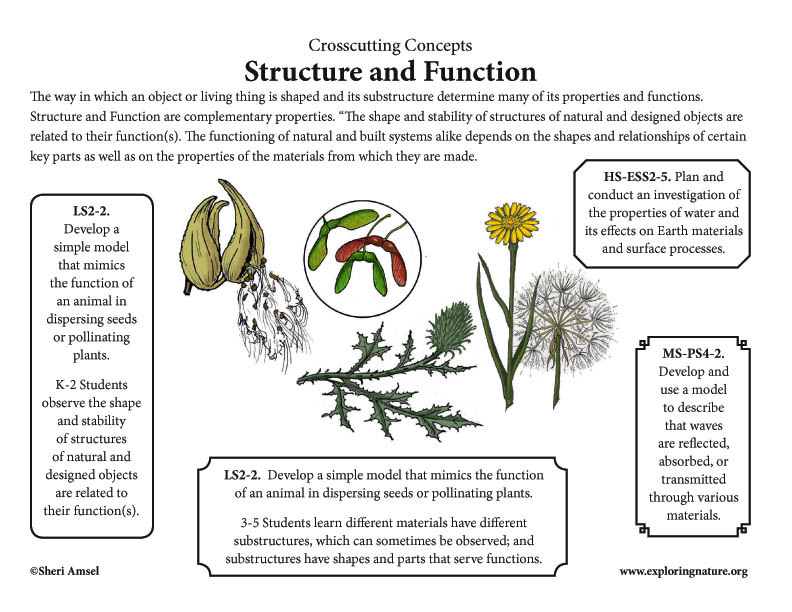 6-8 Students model complex and microscopic structures and systems and visualize how their function depends on the shapes, composition, and relationships among its parts. They analyze many complex natural and designed structures and systems to determine how they function. They design structures to serve particular functions by taking into account properties of different materials, and how materials can be shaped and used. 9-12 Students investigate systems by examining the properties of different materials, the structures of different components, and their interconnections to reveal the system’s function and/or solve a problem. They infer the functions and properties of natural and designed objects and systems from their overall structure, the way their components are shaped and used, and the molecular sub-structures of their various materials. Stability and Change are the primary concerns of many, if not most scientific and engineering endeavors. “Stability denotes a condition in which some aspects of a system are unchanging, at least at the scale of observation. Stability means that a small disturbance will fade away—that is, the system will stay in, or return to, the stable condition. K-2 Students observe some things stay the same while other things change, and things may change slowly or rapidly. 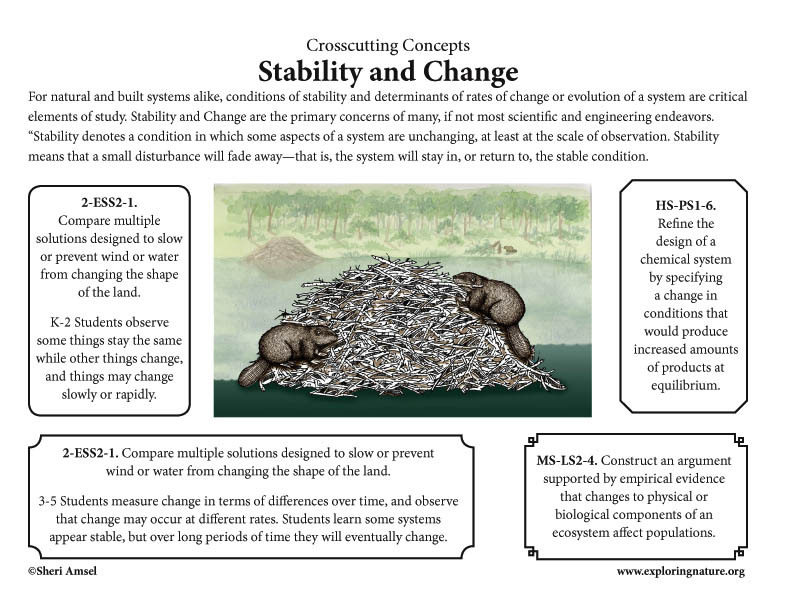 9-12 Students understand much of science deals with constructing explanations of how things change and how they remain stable. They quantify and model changes in systems over very short or very long periods of time. They see some changes are irreversible, and negative feedback can stabilize a system, while positive feedback can destabilize it. systems can be designed for greater or lesser stability.